More Info soon, but mark your calendar! -The site is directly across front the Cell Tower you'll see off of 99 as you travel south, as you approach the base of the tower, prepare to turn right. -Take Highway 99 south past Highway 54, and when you get to Highway 400 at the Conoco Station, follow the instructions above from Wichita. Q: What do I need to compete? Q: When/Where do I show up? 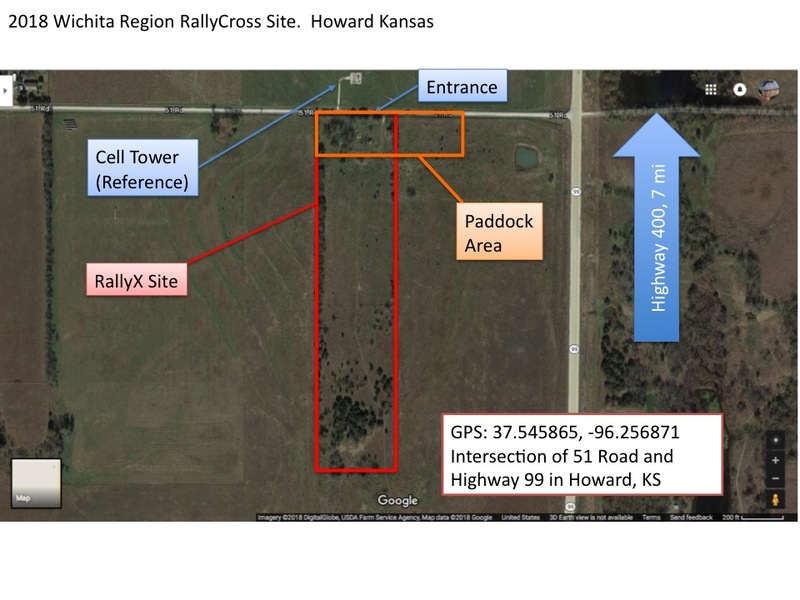 A: A map and directions from Wichita will be posted here: http://www.wichitascca.org/rallycross.html Registration will run from 8:30am through 9:30 on the day of the event. This will be followed by a driver’s meeting explaining how the day will go. Also allow time to have your car tech inspected, and take a chance to walk the course before the driver’s meeting. Q: Does my car need anything special to compete? A: Most cars and some trucks are allowed to compete in RallyCross. While they don’t have to be street legal, each car must pass a safety inspection before being allowed to compete. This covers things like making sure you battery is tied down, your steering and brakes work, and all loose items are removed or tied down. Trucks are allowed to compete at the discretion of the safety steward, If you vehicle poses a roll-over risk when driven hard, it may not be allowed. Contact the event chair or safety steward prior to the event to inquire about a certain car/truck. A: $35 for members, $45 for non-member with weekend membership. Q: Will it hurt my car? A: In my experience it’s no different from driving through a construction zone or a bad road on your way to work. The course’s undulations are less severe than some potholes, and when driven aggressively, dirt will yield to your tires, concrete won’t. Q: Is there anything special I need to do to prepare my car? A: Compared to an Autocross, you’ll want to turn down the damping on your shocks to let the wheels travel. M&S rated all-season tires are fine for rallycross, and will let you get a feel for you car on dirt. Snow tires generally do just as well as a purpose built rally tire due to their soft tread compound and wide sipes. As for tire pressures, make sure to run enough that you don’t blow a bead off the tire. Q: What should I bring with to an event? A: Besides your car, your helmet, entry fee, and enough gas to make it through the event, Other helpful items to bring are: Drinking Water, Sunscreen, Tire Pressure Gauge, Also keep in mind you’ll be working the course out in a field with cars kicking up dust all around you. So wear clothes/shoes you aren’t too fond of, socks/pants to keep the weeds off you legs, and bring some bug spray if you aren’t fond of little critters crawling on you. Q: Did you say Work?!? A: Yes, each competitor is required to work for an equal amount of time that they are running. This is a volunteer organization, and if we don’t work, then we can’t play. Q: Do I have to compete against real rallycars in my wife’s Volvo wagon?